Now here’s an idea: a cupcake dive! Do you live near the western shore of Michigan? Do you plan on getting married soon? Would you like to dive into a table full of delicious cupcakes? If you just said yes three times, you’re in luck. Little River Casino of Manistee, Michigan is holding a “cupcake dive” this Sunday, October 21st at their bridal show. Ten contestants will win a chance to dive into a table of cupcakes, looking for a diamond engagement ring. Megan’s Cupcakes of Cadillac will supply 250 cupcakes for the event. Good luck to all the contestants. 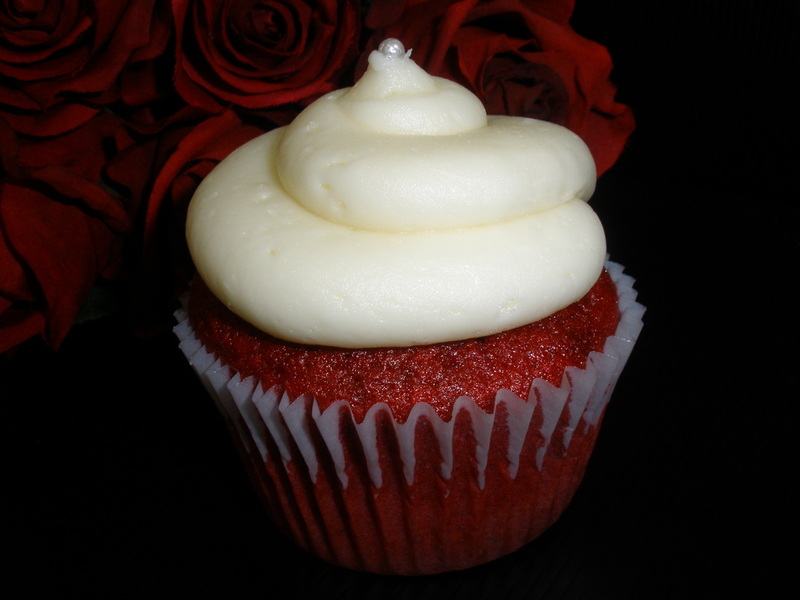 May you not be distracted by a red velvet and continue on the diamond hunt! As many of you may and should know, Dr. Seuss’ The Lorax came out in the movie theaters this past Friday. 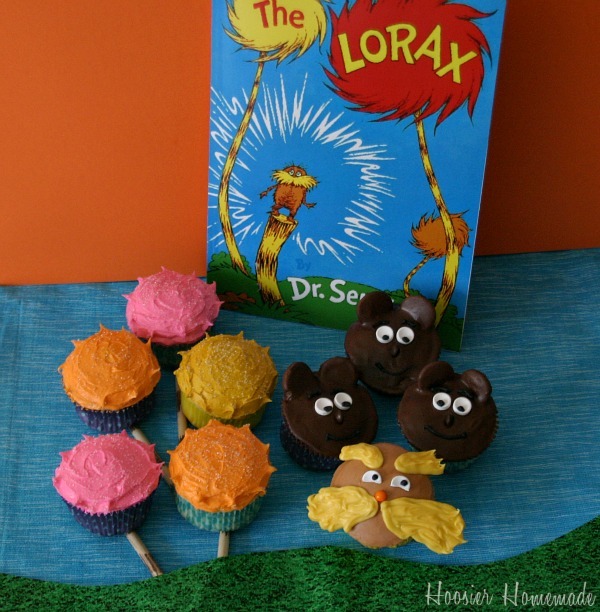 This was also Dr. Seuss’ birthday as well! In honor of him and premiere of The Lorax, Liz from Hoosier Homemade made these amazing Lorax inspired cupcakes! Make sure to check out Hoosier Homemade every Tuesday for Cupcake Tuesday. Who out there has seen The Lorax?! All of the quotes featured in this blog post are by Dr. Seuss. Have an extra $20,000? This titillating piece will be part of the Made in Polaroid benefit auction tonight at Phillips de Pury and Company in NYC. The piece is done by Will Cotton, the artist who, famous for his candy-infused landscapes, created the art used on the cover of Katy Perry’s album Teenage Dream. This new piece is called Silver Cupcake Paper Dress. You can also see his cupcake tiaras here. Love cats? Love cupcakes? Live in Denver? Boy, have I got an opportunity for you! 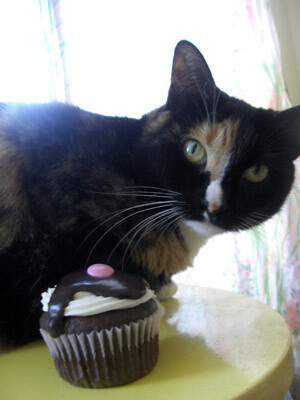 Cupcakes for Cats! On Friday, September 16th, from 11:30 a.m. to 1:30 p.m., there will be a cupcake sale in downtown Denver, at the 16th Street Mall, 16th and California. But this is no ordinary cupcake sale. Funds raised will go to the Cat Care Society in Lakewood. Six bakeries are helping: Butterfly Confetti Cakes, Cake Crumbs, Daveeda’s Delights, Happy Cakes, Lovely Confections, and Maggie & Molly’s Bakery. Cat Care Society is a nonprofit organization that operates a cage free shelter for homeless, injured, and abused cats in the Denver area. You can also visit Cat Care Society on Facebook. You are invited to the second annual Cupcake Camp Santa Barbara tomorrow from 1 to 4 at the Fess Parker Double Tree Resort, 633 E. Cabrillo Blvd. in Santa Barbara. Ten dollars will buy you four tickets that you can trade for cupcake samples from several area bakeries. Proceeds from the camp will benefit Cupcakes for Cancer. Parking is free. The camp will also feature an amateur competition, a cake auction, a fashion show, and a cupcake eating contest. For more information, call 805-448-7336. 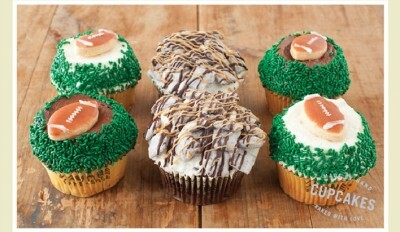 Cupcake Throwdown — New Orleans — Today! 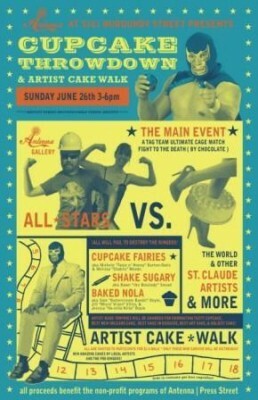 In case you’re in the neighborhood, the first ever “Cupcake Throwdown and Artist Cakewalk” is happening TODAY from 3 to 6 p.m. at Antenna Gallery, 3161 Burgundy St., in New Orleans! Artists and bakers will compete to produce the most creative confections in a range of categories, followed by a benefit cakewalk. 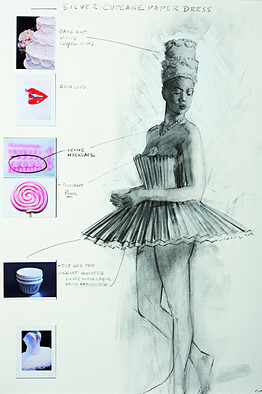 Art and cupcakes. What could be better? Free cupcakes for kids in costumes! All proceeds benefit the nonprofit programs of Antenna/Press Street. Admission to the event is free.